Teaching and music have been a big part of Margaret Ellefson’s life. Margaret grew up in Beaver Creek, Minn., about seven miles east of Luverne. She went to Worthington Junior College and Augustana College, as the university was then called, majoring in elementary education with a minor in deaf education. The Ellefsons lived in Denver and Sioux Falls before moving to Pierre. Margaret taught at Head Start and was an itinerant teacher for the School for the Deaf, working with families and school systems who had hearing impaired students. She started working with the Pierre School District as a tutor and interpreter for a hearing impaired student and later taught third grade. After retiring from teaching 11 years ago, Margaret worked part-time as a bank teller. Playing the piano is one of Margaret’s favorite pastimes. 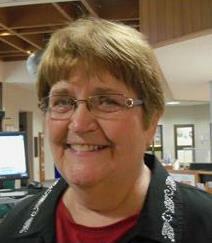 She has been the organist at Oahe Presbyterian Church for more than 30 year. She also plays the piano when Oahe Presbyterian has worship services at Maryhouse and Edgewood Senior Living Center. She often played the piano at the Cultural Heritage Center’s Holiday Open House. Last fall, when volunteer coordinator Dorinda Daniel asked Margaret to play the piano at the Holiday Open House, Margaret said yes not only to that, but to volunteering at the Cultural Heritage Center. Margaret began volunteering in the Heritage Store at the Cultural Heritage Center on Monday mornings. “The time was finally right for me to volunteer at the Cultural Heritage Center. I’m enjoying it a lot. The staff and volunteers are good people,” Margaret said. She enjoys playing the tenor saxophone in the Over Forte Big Band and in the Capital City Band. In addition to volunteering at the CHC, Margaret volunteers at the visitors’ table in the Capitol Rotunda during the Christmas season. She and her husband have two sons. Tom lives in Indianapolis with Tiffany and their children Sam and Morgan. Matthew lives in Pierre with Joy and their daughter, Mia. An important member of the Ellefson family is their Labradoodle, Harley. Thank you, Margaret, for saying yes to volunteering at the Cultural Heritage Center!